Register Log In ECN Forum Forums Photos for General Discussion Is That Receptacle Hot? Is it OK to place receptacles over baseboard heaters? The question I'd be asking is,can a cord running over the top of a heater like that, handle the vertical heat coming off of a heater?. What would the temperature be?. 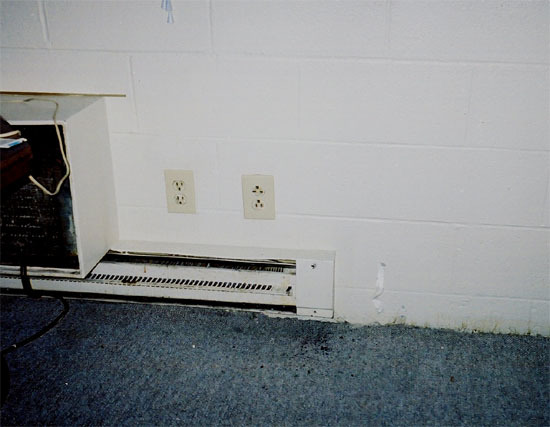 One of those outlets looks to be a 240 volt one, likely for the "window" A/C unit in the picture. That should make nice fireworks when the cord melts. Looks like this installation is 20 years old. No such rule/regulation existed back then. I wouldn't have thought having that A/C unit right above the heater was a good idea either, if only because it will restrict the convection from the latter. On a serious note though, why are the grounds down on the left-hand receptacle and up on the 120 and 240V right-hand ones? When do you have the heat and A/C running the same time? OK, guys, time for me to tell "the reat of the story." This pic is from a hotel near the "downtown" of Reno. It will soon be demolished to make room for a new bus station. The rule "no receptacles over heaters" is alluded to in 210.52. As this hotel is well over thirty years old, it is very possible that the code did not address the issue. As Trumpy suggested, there is a concern that the heat coming out of the unit might damage cords. One of the receptacles- the one nearest the air conditioner- is a 'normal' convenience receptacle. The receptacle to the right, however, is another story. THAT receptacle will look funny to those with good eyes. That is because this receptacle has a standard 120 pattern on the botton, and a 220 v. pattern above. This receptacle is on the same circuit as the heater. The 220 part is to plug in the air conditioner. The only problem with this set-up is that the 220 circuit comes from a different panel, and has no neutral. The 120 part, where active (not every room is) is powered from one leg of the heater circuit, and uses the conduit as a "neutral." In many cases, this is accomplished by using a piece of wire to connect the ground screw on the device to the neutral screw. The return current than flows through the ground strap, mounting screws, and into the metal box. Since the device strap almos never sits snug against the box, the screws get hot enough to scorch/char the cover plate. Those combo receptacles are still available. But I would not suggest using it like this. The 120 part, where active (not every room is) is powered from one leg of the heater circuit, and uses the conduit as a "neutral." Saw one of those on eBay recently. Also if my eyes are good, all of those receptacles seem w little scorched.